Gin partnership is just the tonic for Viola campaign. Emma Kinton and Paul Escreet tasting the prototype Viola gin in Hotham’s Distillery. 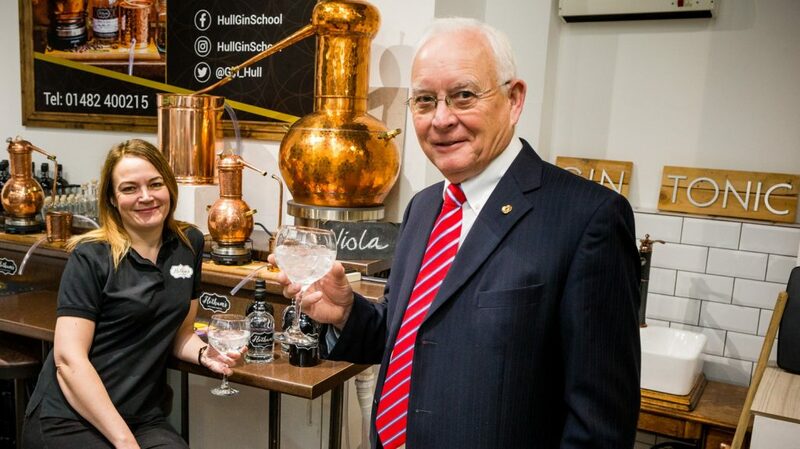 Emma Kinton and Simon Pownall, who opened their distillery in Hepworth Arcade, Hull, earlier this year, have started production and are now taking orders for Christmas and beyond. They already had smaller stills named after celebrities with a strong Hull connection, including Sir Tom Courtenay, Reece Shearsmith, John Godber and Paul Heaton. The Viola, built in Beverley in 1906, operated from Humber Dock – now Hull Marina – as part of the Hellyer fleet of boxing trawlers. She was requisitioned to defend the UK in the Great War and left Hull for the last time in 1918 on a career which took her to Norway, Africa and Argentina, catching fish, hunting whales and elephant seals and supporting expeditions in the South Atlantic. Her stories are of Hull men sailing to the most distant areas of the North Sea and working in perilous conditions for weeks on end, transferring their catches by rowing boat to fast steam cutters which fed the nation’s growing appetite for fish and chips. When the First World War broke out, Viola and her Hull crew were on the front line of the maritime conflict, steaming thousands of miles on patrol across seas infested with mines and U-boats. Viola had numerous encounters with the enemy, being involved in the sinking of two submarines. More than 3,000 fishing vessels and their crews saw active service during the Great War and today Viola is almost the only survivor. In the 1970s, Viola was mothballed after the closure of the whaling station at Grytviken, South Georgia. Sitting on the beach, where she remains, the old trawler was the target in 1982 of scrap metal merchants from Argentina. But when they landed they ran up the Argentine flag, an action which led to the Falklands War. Be the first to comment on "Gin partnership is just the tonic for Viola campaign."